“Ouch!” said pretty much everyone on the Washington Redskins offensive line this past ’17-’18 season. 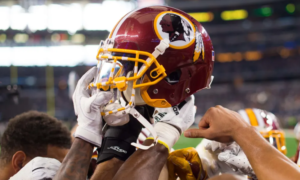 No offensive line in the NFL dealt with the myriad of injuries and the absurd amount of mixing and matching along the line as the Redskins did. 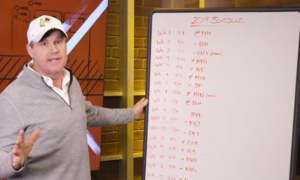 The player that benefitted the most from all the chaos was the 199th pick in the 2017 NFL Draft, Chase Roullier. Roullier was picked in the 6th round to add depth to the interior of the offensive line. At the University of Wyoming, Roullier played both guard and center and it’s because of his versatility that Washington drafted him. 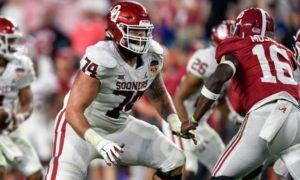 Immediately when he was picked, fans were hoping that the Redskins drafted a gem and found their future starter at left guard over Shawn Lauvao or even Spencer Long at Center. Roullier later in week 8 of the season got thrust into a starting role after Spencer Long was placed on the injured reserve list. Roullier started in every game after that except for weeks 12, 13, and 14 due to an injury of his own. And shortly after that, Keim writes this about Shawn Lauvao: “They know they need to upgrade, and he has missed 22 games the last three years combined because of injuries. Do the math.” To read Keim’s entire write up on all of the Redskins’ upcoming free agents (I recommend it), go here. So it appears that the Redskins are electing to go with Roullier as the present and future center of the offensive line while finding a new left guard this offseason. Which brings us to why I’m writing in the first place. How good is Chase Roullier? What did he show in his rookie campaign as a starting center? Well, let’s take a look, shall we? Before we jump into this, I’ll preface by saying I studied all of his games where he was listed as the starter at center. I didn’t cover each game that he played in, only when he started. One of the things that immediately jumps out at you while watching Roullier play is that he is very stout. He’s got big strong legs and he uses them very well to anchor in pass protection and drives with them while run blocking. He’s also got very strong hands and when he punches with them, they bring a lot of force. On this play, you can see he does a great job of fitting his hands inside with low pad level and uses his legs to drive and finish the block. He doesn’t always get a ton of movement forward in the run game but he also doesn’t get pushed back either. His power and aggressiveness, however, really shows in pass protection. And here’s a look at him using his legs to move guys out of the pocket and finishing the block. This is a great rep of just being nasty in pass protection. The Vikings here run an interior stunt with their defensive tackles. Roullier feels the defensive tackle coming from the left side, rips him across his face, and then drives him to the ground. Great rep. As I mentioned before you can see that Roullier has a strong punch and he uses it very well in pass protection. Here the Seahawks show a 5 man front. Each guy on the offensive line is covered. 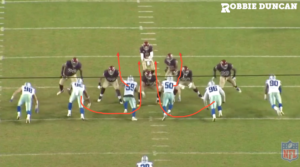 The protection calls for big on big (or BOB) which means that each man on the line is by himself blocking the man in front of them. Roullier, in this case, is big on big with the nose guard lined up in a “1 shade” (outside shoulder of the center). As the nose loops around towards the right side of the offensive line, Roullier has to stay with him. He cannot worry about the blitzing linebacker. That’s what the running back is there for. Offensive linemen, in general, are coached to always take care of the “down guy” (meaning the defensive lineman). You never want a running back trying to block a defensive lineman, it’s asking for trouble. So Roullier sticking to this rule follows the nose and delivers a great punch that blasts the nose to the ground. Here’s another good look at how strong his punch is in pass protection. Here Roullier delivers a quick firm punch to the nose knocking him towards Lauvao. It’s not as awesome as the first clip above this one but this is still just as effective. You want separation from the defensive lineman when in pass protection. The further they are from you the less effective their pass rush is. When they’re in close, that’s where you can run into problems, which I’ll get to later. The other way that Roullier uses his legs effectively is having a strong base and anchoring against the common power rush from defensive tackles. Both of those reps show Roullier squaring up with Linval Joseph and Domata Peko, both guys are big strong 325+ weighing defensive tackles. You can see he locked Peko down pretty easily, didn’t get pushed back at all. Stonewalled. Joseph gives him a little more trouble but Roullier does a great job of working his hands to regain leverage and locks him down before the ball is thrown. One of the big things asked of a Center on the offensive line is they have to be very smart, make all the initial calls on the line, identify keys, etc. That’s a tall order for a 6th round drafted rookie to handle, but Roullier shows he has the smarts to handle the job. This play here is a simple inside zone play with the tight end kicking out the defensive end on the backside. The problem though is that the Cowboys had the perfect defensive play called to counter this. They run a zone blitz with the backside defensive end dropping into coverage, the rest of the defensive line slants to their left, and the nickel corner blitzes off the edge to force the no gain on the play. Left tackle TJ Clemmings needs to recognize this and pick up the corner, Lauvao in return would pass off the playside defensive tackle to Roullier and climb to the linebacker. This could’ve been a really good run had the blitz been recognized and picked up properly. Roullier seemed to be the only one to recognize what was happening after the ball is snapped. He sees the nose lined up over him slant left, passes him off, and picks up the defensive end slanting right to him. This is great adaptive playing from Roullier. 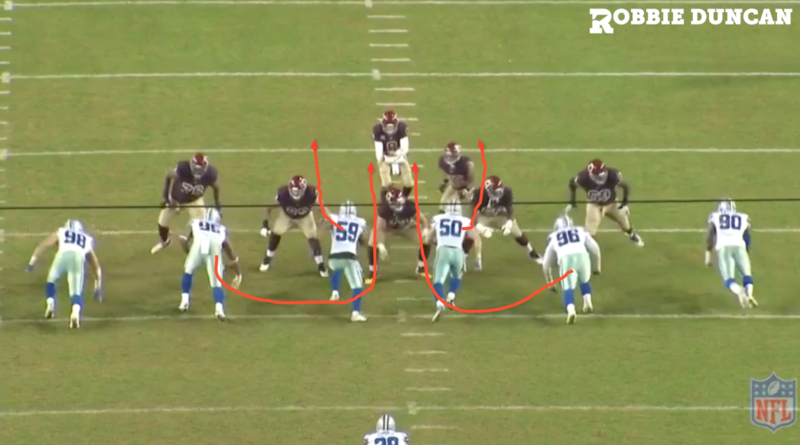 On this play, the Cowboys bring another look to confuse Roullier and the rest of the OL. They show a double A-gap blitz by the linebackers but the twist is, they added a stunt with the defensive tackles as well. The linebackers rush wide in the A gap trying to open up an inside rush for the defensive tackles as they loop around them. You would think that a rookie center would freak out and panic on who to block, but Roullier picks it up perfectly. Here he knows that he has the running back in to help pick up the blitz, the protection has him setting to the left side to pick up #50 and the running back picks up the other one. As the stunt plays out, Roullier sees the defensive tackle looping around, passes off the linebacker to the left guard, and picks up the defensive tackle. This is an impressive play. Another aspect that needs to be looked at as a center is how well does he move in space? In most screen plays that are called, the center is tasked with running downfield to block the more faster players on the defense. This is one of Spencer Long’s best qualities along with his ability to pull, in my opinion. So it’s important that Roullier has the ability to play in space too since he will be the starting center going forward and especially since Head Coach Jay Gruden loves to call screens. The good news is he does really well. On the screen play against Arizona above, you can see how he’s way down field leading the charge for the running back to run it in for the score. He also does a great job of mirroring the safety as well. Then the screen pass against the Saints above, he does a great job of identifying who his man is and then delivering the clean block for the big gain. You can go ahead and check off this box of requirements for a starting center; Roullier can handle this part. With all the good that’s been shown, Roullier is not perfect and does have things he needs to get better at. The most consistent thing that showed in my study of his film is that he is very susceptible to the swim move from defensive tackles. Roullier has a habit of over-extending and lunging at guys which leads to him getting beat pretty badly. As you can see it happens quite often. It’s a hard move to counter at center since you’re already coming from a lower position than the other offensive linemen. What he needs to do to improve on this in pass protection is work a quick strike with your hands and then get back. You then have more space between you and your man to react and not get your hands knocked down. Another way to do it is to be patient and let the defensive lineman make his move first. If you time your strike well enough you can catch him right under his armpit and drive him out. This is a very coachable part of his game that can be worked on, but it is without a doubt his biggest weakness right now. Here the Redskins run an outside zone play to the right side. Initially, Roullier reaches the nose and has good leverage with his head in front. He doesn’t maintain that leverage, however. He eventually lets the nose cross his face which forces the RB to cut back inside. Had he maintained that same leverage and fought to keep his head in front, there was a hole right next to him for the running back to get more yards. He also needs to improve on staying on his blocks when he climbs to the linebackers. He takes good angles to linebackers, gets a nice fit, but fails to sustain those blocks. Finishing your block on a linebacker can be the key to a very big run compared to a minimum gain with yards left on the field. Chase Roullier shows many great qualities of a starting Center in the NFL but also has some areas that need improvement. With the opportunity given him during the ’17-’18 season, Roullier proved himself to be a solid starting quality center. In return, he has also saved the Redskins some money as I expect they will let Spencer Long sign with another team and look to draft a new LG instead of signing one during Free Agency. I’m excited to see what Roullier can do with a full offseason under his belt as well. 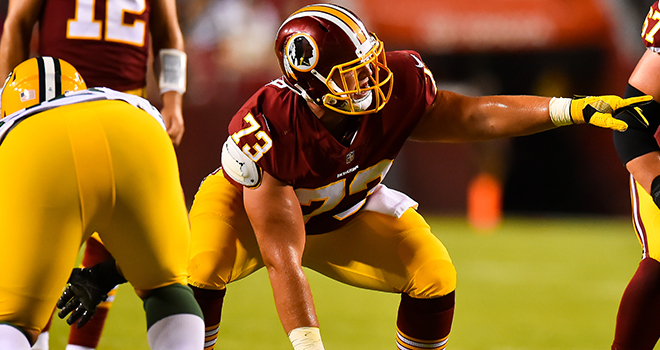 The Redskins did, in fact, find a gem in Chase Roullier. The present and future of the center position seem bright.